A unique request to measure sub-millimeter displacements in 3 axis of freedom required Civionic Engineering & Consulting Inc. to develop new multi-axis , multi-sensor structural health monitoring system within only 3 months of time. The new Rogers Arena South Tower development in the heart of Vancouver, BC, Canada which required excavation only a few feet away from three existing bridge piers needed to make sure that during the excavation period and during the construction period of the new 320’ high mixed commercial/residential development, there is no shift of the existing bridge structure. Shifting of the bridge structure could have had catastrophic consequences. The owner of the structure wanted to make sure, a high precision measurement system is in place prior to excavation to detect any anomalies during the excavation and construction period. By combining industrial high precision Laser displacement meters and a specialized, high precision 2-dimensional Laser position target detector, Civionic Engineering & Consulting was able to provide the client with readings of 0.3mm precision for the transversal displacement of the piers and 0.1mm precision for the longitudinal and vertical displacement of the pier. A total of 3 systems were deployed and the readings were collected 24 hrs a day, 7 days a week since July 2014. All systems are wirelessly connected and allow for remote configuration and monitoring via the internet. 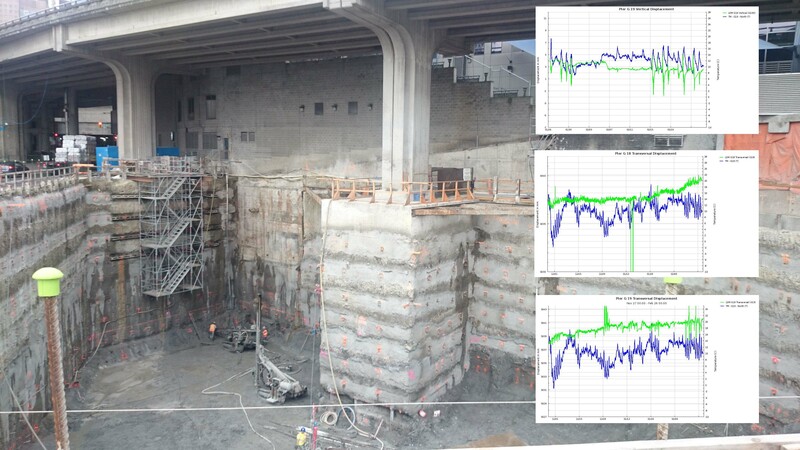 A cloud based data consolidation server allowed visualization and combination of the Civionic system with other data sources collected on the construction site. Typically surveying techniques allow for +/-5mm precision of displacement. This new technology allows for measurement of sub-millimeter accuracy to detect any shift of structures up to a distance of 500m. In today’s days of compressed construction sites and close proximity to other buildings or structures, these systems will provide a more precise and more accurate solution to protect owner’s of adjacent buildings or infrastructure against construction based damages. Civionic Engineering – bridge sensors, integration of sensors, civil engineeringUncategorizedBetter Than Surveying..